Growing up in a basketball family, March Madness was a very important time in our house. We would sit on the couch together to watch the games, listen to my father discuss each play, and root for the underdogs. My mother, who always cooked dinner for our family, would bring our plates into the living room so we could be properly nourished; even though if you asked my dad a March Madness game is all the nourishment a young body needs. As I have left my parents house the tournament is no longer home cooked meals and evenings on the couch with my family. It’s now celebrated in loud bars with big TVs, imported beers and spinach dips. So after all that bar food and beer drinking my body was ready for a restart. Feeling similar to how I do now I had my first juice cleanse experience this past January after an over indulgent holiday season. I purchased the 3-Day Cleanse written by founders, Zoe Sakoutis and Erica Huss, of the Blueprint Cleanse and finished the three days feeling refreshed and clear of the holiday excess. I have yet to do another three continuous days of just juice, but I will occasionally do a full day or two days of juice with a light meal for dinner to give my body a break. So this time around I’m doing a two-day cleanse with a light dinner at night. 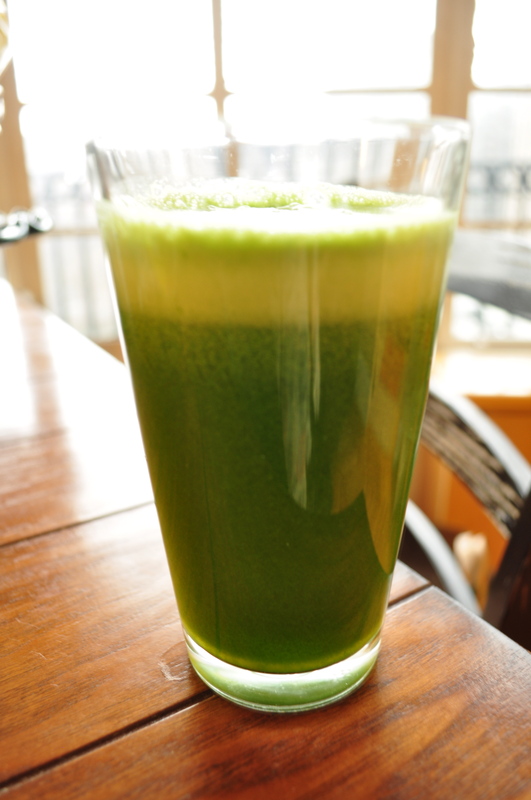 A basic day of the cleanse is three vegetable juices, two fruit juices and then a light salad. I start my morning off with a glass of room temperature water with a squeeze of lemon. While I’m drinking this I begin my prep for the veggie juices. 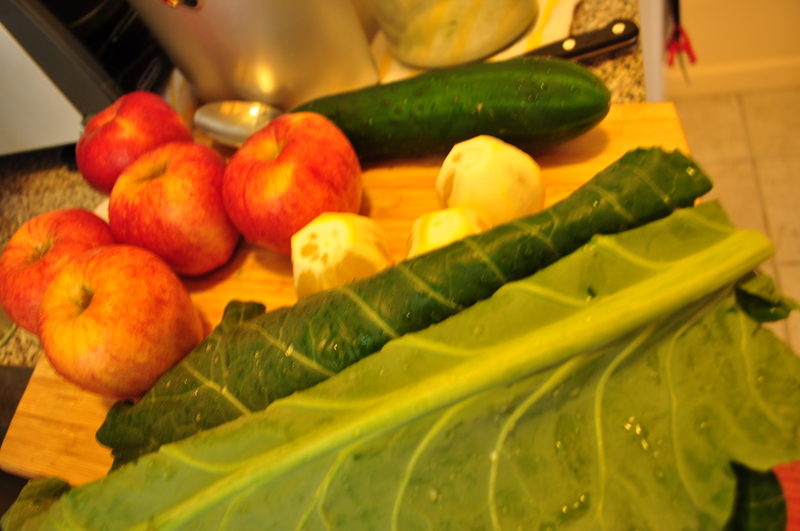 I start with 5 apples, 1 cucumber, 3 lemons 2 handfuls of spinach and 6 large leafs of greens. I used collard greens this time around, but I have used kale and chard. 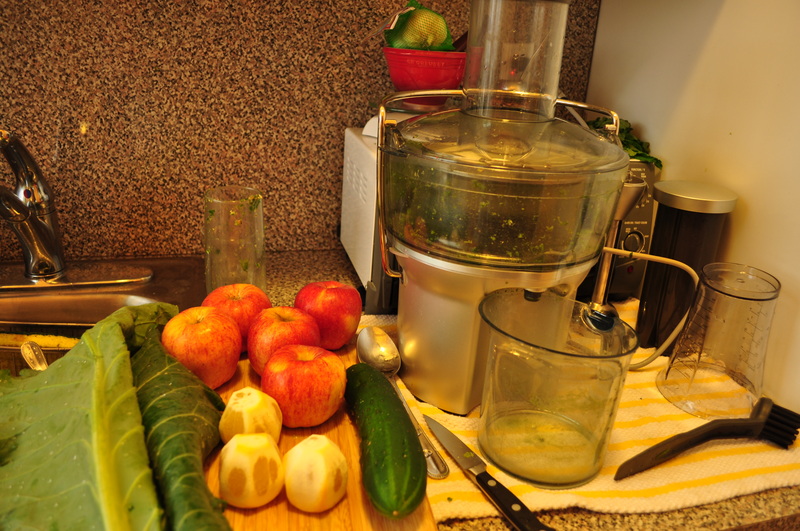 Place all these ingredients in a juicer, I use the Breville Juice Fountain, and its as easy as that. With these ingredients you should be able to yield 32 oz. of liquid goodness! I make two juices at a time and store the other 16 oz for later. I try to space my juices out every 1 1/2 hours to 2 hours. The next juice is a pineapple mint slushy. 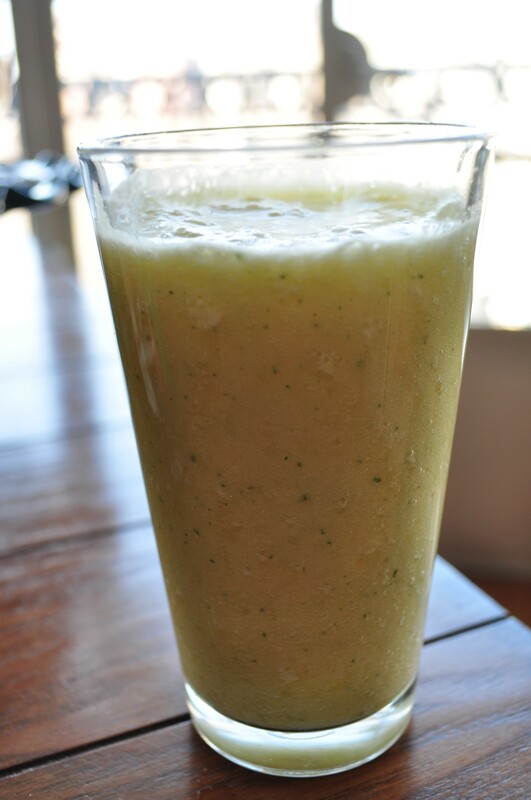 I take my hand blender and blend pineapple chunks, mint and ice. This is one of my favorite juices as its refreshing and the ice gives it that thicker consistency that you start to crave when only drinking juice! I follow the pineapple with another green juice then move to a watermelon juice. The watermelon juice is made just like the pineapple, with the option of mint (I prefer mine without). By this point of the day your body is a little weak and starting to feel pretty hungry. 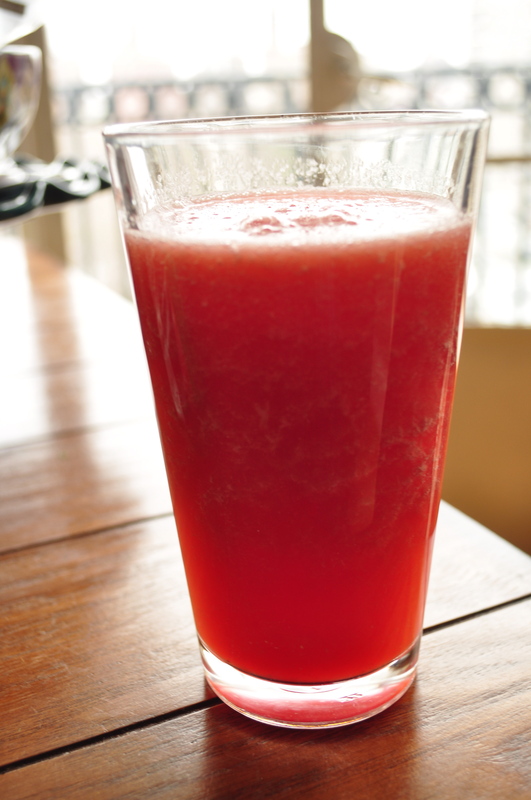 I think the watermelon juice takes the edge off nicely with the right amount of sweetness and natural sugar. If I am doing a full day of just juice I do one more green juice and then a cashew milk drink at night. But since I’m doing a meal in the evening I skipped the last juices and made a mixed green salad with tomatoes, bell pepper, and Trader Joe’s lentils. It’s the perfect way to end my evening. My body is much happier now that I am giving it the proper attention that its been screaming for the past three weeks, but was mostly drowned out by the loud bars, the big TVs, imported beers and spinach dips! Mike is right, and I’m sorry for not expressing the deliciousness of all the juices, but especially the green juice. It really makes the whole cleansing process that much more enjoyable! Those fruits and veggies sure do look delicious. If I’m not yet brave enough to endure a day fueled solely by juice – do you think it still counts if I wash down my In-N-Out burger with a glass of your watermelon juice?! Thanks for the great tips, I will definitely give those juice recipes a try as it heats up in Cali. Happy juicing! I think that washing a burger down with the watermelon juice is a much better option then a soda!